Hi everybody! I’m Kimono Musashi Katana or “Kimo” and I’m a white belt enrolled at Kick Masters Karate. I am so proud of my studio and love all the black belts and instructors that work to make me better. I know that some of you have tons of questions for me, so feel free to write me at kimo@kickmasterskarate.com and I’ll answer you as soon as I can. In the mean time, keep practicing just like me so we can make it to black belt level together. Have a terrific day and I hope to see you soon! Jacob Morgan asked, "Can you blink?" Thanks so much for your e-mail...I love answering questions from kids. I have a hard time blinking because of the size of my eyes. My eyelids are already extremely big and in order for me to blink, I'd need them to be even bigger. Human eyes are tiny...a lot smaller than mine. If you do see me blink, it's because I'm really tired! I work out really hard! Keep those questions coming and be sure to keep practicing your karate. If not, I'll be a black belt before you! Steven James asked, "Do you know the white belt kata?" To answer your question, I'm still working on the white belt kata. I'm having a ton of trouble on the circle blocks�my tail keeps getting in the way. 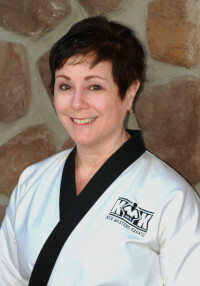 If you�re a student at Kick Masters, I'm sure you're already pretty good at those. I just can't seem to get scooping the ice cream and making muscles at the same time. Dragons show their toughness by breathing fire and having smoke come out of our noses. When I'm really scared, I'm really good at that, but that doesn't help me learn the kata any faster. Oh well, what's Master Rando say? "Never Give Up!" Randy asked, "How old are you? Do you like pizza?" Thanks for the questions, I love em'. I was born on January 1, 2001 in Korea. That means that I'm now 10. Can't wait for my driver's license! As far as pizza, I love it. My favorite is Pappa John's but Pizza Hut is pretty good too. My absolute favorite food is chocolate chip cookies, just like Master Rando. He's a great teacher you know. Can't wait for this year's Karate Christmas Party, I was invited. I hope I can go. See you real soon Randy! Matt asked, "When will the first kyu browns see you again?" Thanks for the question Matt...I love to answer them. I'm not sure when you'll see me again. Master Rando says I can test for my gold belt pretty soon, but I'm not sure I'm ready (I still can't seem to get those circle blocks). If I test, you can see me then. Keep your eyes open though...you never know when I'll turn up! jaryd williams asked, "when wiil you see the redbelts"
Thanks for your question Jaryd. I'm pretty sure I'll be attending the Christmas Party, but I have to wait and see. I'm getting the flu shot on December 11th and I hope I don't get sick from it. If you are a red belt, I'm sure you're really good at the jump, back leg roundhouse kick. Master Rando says I will learn that one soon, but for now he makes me practice my straddle stretch. Anyway, hope to see you soon and keep up the great work red belt! jaryd williams asked, "how was your christmas"
Thanks for asking about me Jaryd, my Christmas was fantastic. I got a new scooter, a pair of black socks, some peanut bridle, and brand new Legos (Star Wars dude)! Hopefully your Christmas was good. Keep doing your slowkicks and remember to practice daily�it has really helped me! jaryd williams asked, "Can you do a 180"
Hey buddy! I've been working on my splits but garsh darn it, I'm so far away. The last time Master Rando had me do the stretching machine I was at 115...my tail keeps getting in the way. Oh well, like all the Black Belts say, "Never Give Up!" jade cordial asked, "who is your favorite blackbelt?" Thanks for the question Jade. Hhhhhmmmmmm...let me see? Favorite Black Belt? I think I really like working with Ms. Beechie. She's a great example of skill and poise, and her story of perseverance is fantastic. Did you know she's had 5 hip surgeries to correct left hip dysplasia? WOW, she never gives up! How's that for inspiration? Keep up the good work Jade and be sure you don't ever give up either! Matt Lowery asked, "Are you going on the trip to Disney?" Great question Matt! I'm not sure yet. I've got another trip planned around the same time and I really can't be in two places at once. There's one thing I do know...Walt Disney World is one of the coolest places on the planet so if I'm able, I'm definitely there! Samantha Preaskorn asked, "Do you go to the Karate Kamps?" 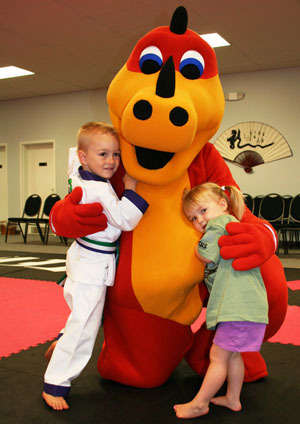 I may make an appearance at Karate Kamp this year...Master Rando hasn't signed me up yet. I have a beach vacation scheduled soon so I may be out of town. You'll just have to wait and see!